SFO lies 14 miles south of the city, near US101. If you’re staying Downtown, take the train from the BART station from the Departures/Ticketing level of the International terminal (accessible from all terminals via SFO’s free Airtrain—take to Garage G/BART Station stop). The journey to town costs $8.65 and takes 30mins; trains leave SFO from 4am to 11:50pm. BART is a far better bet than the four SamTrans bus routes—the KX, the 292, the 397 (overnight only) and the 398—that serve SFO (fares vary from $2 to $5); the buses can take ages to make the journey from the airport to the city. Shuttle vans, which hold eight to 12 people and offer door-to-door service, are a more direct option. Shuttles operate on a walk-up basis at the airport, though you must book for your return journey. Firms running shuttle vans include Airport Express (415-775-5121, airportexpresssf.com), SuperShuttle (650-558-8500, supershuttle.com) and American Airporter Shuttle (415-202-0733, americanairporter.com); the airport’s website has a full list. 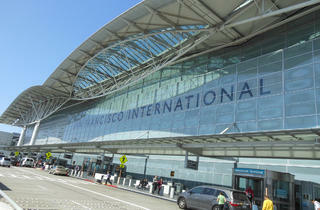 The fare into San Francisco will be around $17; ask about discounted rates for two or more travelers in the same party. Vans leave regularly from the Departures/Ticketing level of the terminal from the roadway center island, outside the baggage-claim area. 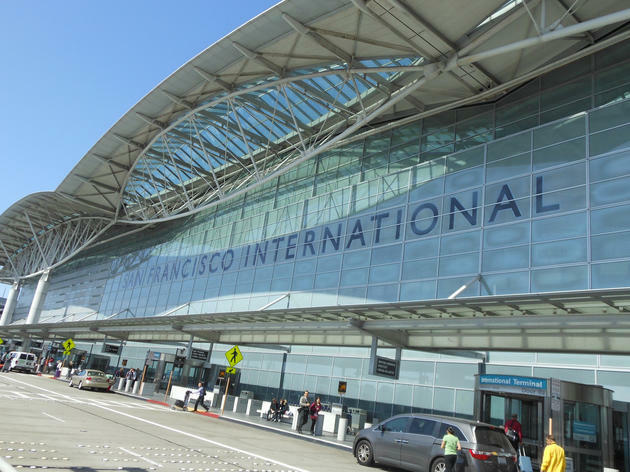 Taxis run to and from SFO, though they’re pricey: expect to pay around $50 plus tip, though you might be able to haggle a flat rate. For a limousine, use the toll-free white courtesy phones located in the terminal to summon a car (walk-up service isn’t permitted). The fare will likely be at least $60 plus tip. SJC is the airport of choice for many Silicon Valley travelers. However, if you’re not driving you’ll face a lengthy and/or pricey journey to the city. Without a car, the best way to get to San Francisco from SJC is by train. Ride the VTA Airport Flyer bus (20mins) from the airport to Santa Clara station, then take the Caltrain service to San Francisco station (4th and King Sts, $9, 90mins). Door-to-door shuttle vans, available on a walk-up basis, are quicker, but cost up to $90. A taxi will set you back $150 plus tip. The ride into San Francisco from Oakland Airport is simple by train. The AirBART bus shuttle links the airport to the Coliseum/Oakland Airport BART station; the ride costs $3 and takes 15–20mins. From the station, take the next Daly City or Millbrae train to San Francisco ($4.50; about 25mins to Downtown). Note: this is not a safe option for lone passengers at night. Instead, take one of the myriad shuttle vans, available on a walk-up basis, or a very expensive taxi/limo ride.